At the time of this writing, there were over 1.1. billion websites on the web. By the end of today, over 5 million blog posts will be published (this doesn’t count the number of white papers, press release, etc). 631 posts will have been published by the time you’re done reading this post. Kind of puts things in perspective, doesn’t it? If someone clicks your headline in the SERPs, it’s kind of a miracle – especially if you haven’t done any optimization. As hard as it is to get someone to your site, once they get there you have to keep them. You have to persuade them, in an incredibly short amount of time (in 2014 it was about 15 seconds) – Not only do you have to stand out, but once they get in you have to persuade them, in the short amount of time you have, that you have what they need. So what could be missing in your content? As it turns out, quite a lot. Let’s assume that you are targeting the right market. I know, that’s a big assumption, but stick with me. You expect a single content to achieve more than one objective, so it’s not focused. Each one of these is a big problem. If you hit more than one, your content goals are probably failing horribly. Time to fix that. What are you writing for? 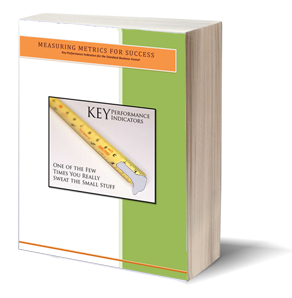 I don’t mean the obvious answer – business growth. I mean, the next piece of content, what is it for? What single action do you expect your readers to do? Choose a single objective, pinpoint the key results, and move forward (come back or subscribe to learn more about this process called OKR). Since we’re assuming that you have the right target market, how could you be writing for the wrong audience? Simply put, web readers are not the same as print readers. Even those that read books with glee have a tendency to shift into the mindset of a web reader once they get online. With few exceptions, the people reading your blog posts are not sophisticated creatures ready to settle down with a good blog post and a glass of wine. In general, the people reading your blogs are wild animals. We use information foraging to decide whether you have the information we need. We don’t want to read long posts unless we know we’re going to get something out of it. Humans are silly creatures. We do things because that’s what we think we’re supposed to do. Maybe we think people won’t know we have an awesome product unless we tell them. So, we’re supposed to tell them that our product is awesome, fresh, and better than any other, right? Obviously. And yet, there are many companies out there that manage to get conversions without telling everyone how cool their product is. Take Dropbox, for example. Now, if you don’t have umpteen million files all over the place, and all you ever use the computer for is search, games and maybe some music, that’s not real interesting. If you’re like me, however, this is interesting. I mean, as a business owner, I like being able to reach my files no matter where I am. And it’s free? And they offer a one-click sign up with my Google login? Huge bonus and a time saver? I’m so there. Consider me converted (I really am; I have a Dropbox account that I use with my clients when big files need to be passed back and forth). Nowhere on that page do they come out and say how awesome their product is. They’re relying on their target market thinking it’s awesome. Because, hey, their target market are the people who need it. This is the key. If your product is something people need, it’s already half-way awesome. If you’re providing information that people want to know, you’re already halfway there to persuasive. I’m not going to lie to you. Creating content is easy – anybody can type a sentence. However, creating persuasive content that people to react is hard. It’s like, Parkour hard (if you don’t know what parkour is, look it up. Now that’s cool! Crazy, but cool). We’re talking epic grade jumps. Creating content that stands out from 5 million other posts and persuades people to act is even harder than that. – But it’s not hit and miss. 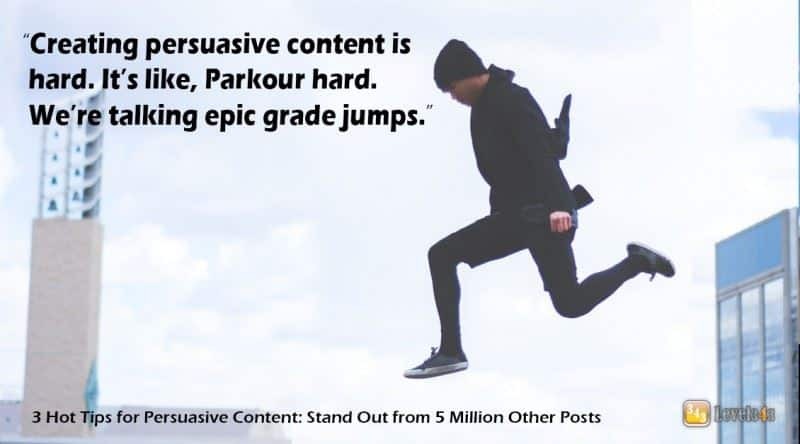 There are many (not millions, but lots) individuals that have found the secret of constantly creating excellent, converting, persuasive content. Follow the tips above. Read through our blog. Read through other blogs. And when you finally have an understanding of what it all entails, give us a call. We’ll help you build a clear content strategy to get your content to the right channels. Until we hear from you, to your success!